Eddie Campbell is totally on point in a couple of posts (here and here) concerning Roy Lichtenstein’s use of comics imagery in his paintings, and does his best to rub out the old bugbear, fueled by the inferiority complex comics fans often habour on the behalf of their preferred medium, that Lichtenstein was a plagiarist. Though Campbell has pretty much sorted it out, I have a few remarks I would like to add. The accusation of plagiarism is, of course, absurd. Anyone familiar with sample-based music will be well aware of that. 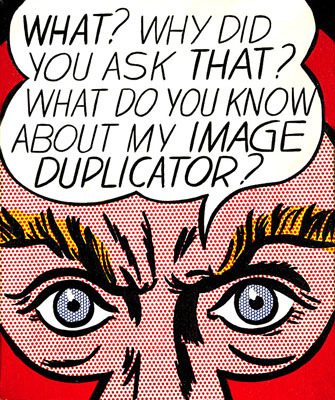 Lichtenstein, however, is less a sampler and more of a transformer. Importantly, his appropriations are from one medium to another. While his superb sense of design is widely acknowledged, a lot of people neglect the painterly qualities of his work. His images are not photostats, or even silk screens, of comics panels, but bona fide paintings with a wholly different set of aesthetic qualities. He transforms the off-register Ben-Day of mass printing into a sui generis form, achieving something that is emphatically not cartooning, but painting. This of course means the concomitant transformation of often rather mundane sequential art to the icons of 20th-Century popular culture some of these images quickly became.